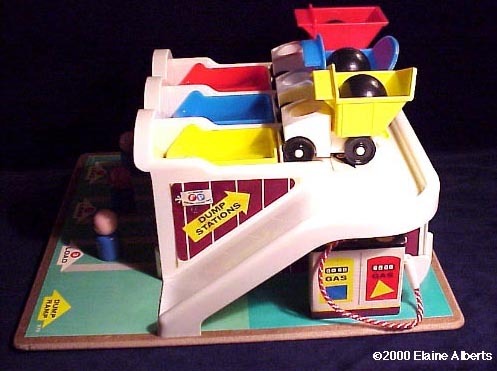 Description: This little people set was the first that had a masonite base. 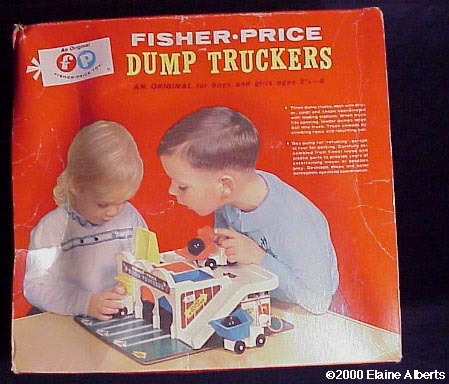 The Little People sets prior to this were either pull toys (such as the Safety School Buses and Snorkey Fire Engines) or toys without a base, such as the #932 Amusement Park and the #719 Fisher-Price Choo-Choo. When one of the accessory trucks back up to one of the 3 loading station buckets on the top level, an automatic trip makes the tilt-bed truck dump a ball into the bucket. When a truck backs up to one of the loading docks on the bottom level, it dumps the ball back into the truck bed. The back of the base has a small service station. 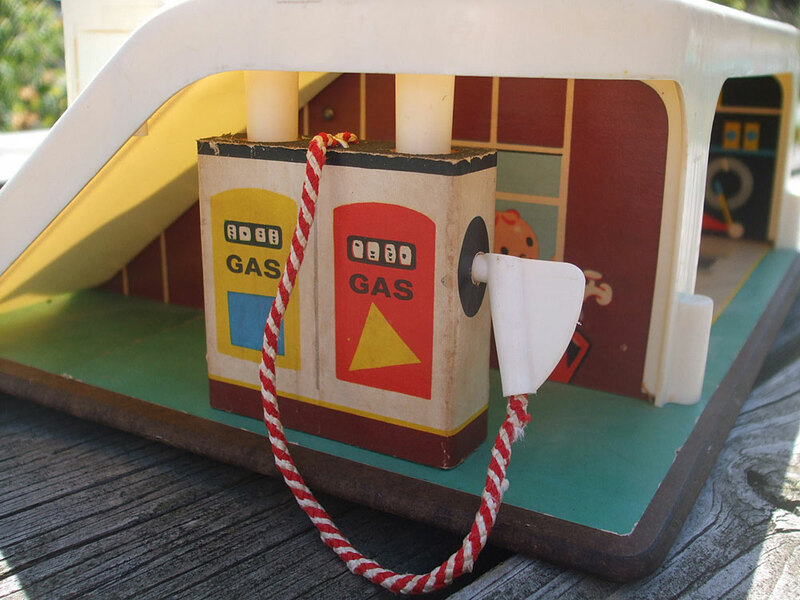 The side of the base has a mini-gas station with a molded-in gas pump. The gas pump has a red and white braided hose with a white plastic nozzel on the end that fits perfectly into the accessory truck gas hole. B979B - Dump Truckers Warehouse - This base has a Yellow #1, Red #2, Blue #3. *See Variations Below. 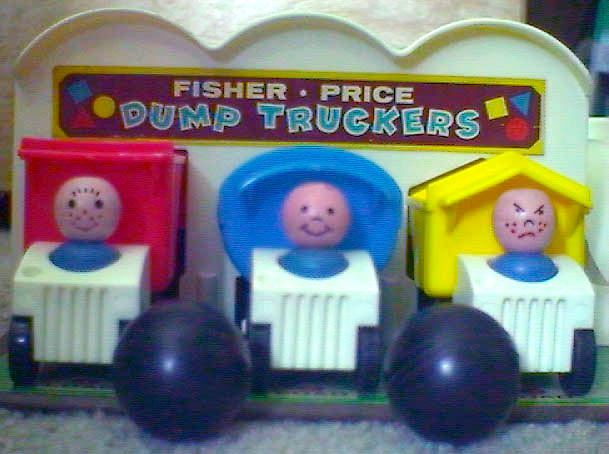 FPT419 - Dump truck with a yellow squared tilting bed. 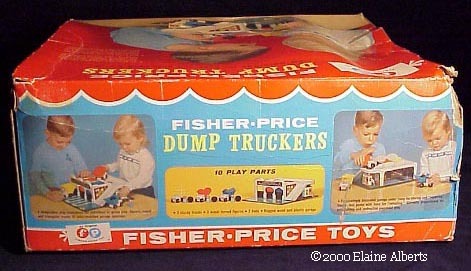 FPT417 - Dump truck with a red rounded tilting bed. FPT418 - Dump truck with a blue triangular tilting bed. 3 each - FPT259 - Solid wood black ball that measures 1-1/2" diameter. See our Replacement Reproduction Wooden ball: TOT100. PWW - Light blue boy with a frowning face and freckles. RWW - Light blue boy with a smiling face, freckles, and "" eyebrows. QWW - Light blue boy with a smiling face and red heat-stamped hair. 3 each - FPT258 - Hollow plastic black ball that are made with 3 lines (one of which is a seam) running around the middle. The lines are about 1/8 inch apart, and there is also one hole about the size of a pencil point along the side of the 3 lines. Measures 1-1/2" diameter. See our Replacement Reproduction PLASTIC ball: TOT105. B979F - Dump Truckers Warehouse - This base has a Blue #1, Yellow #2, Red #3. *See Variations Below. 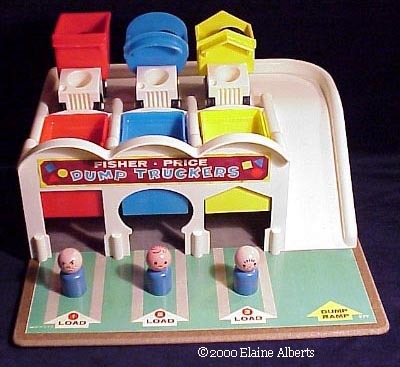 FPT427 - Dump truck with a blue squared tilting bed. 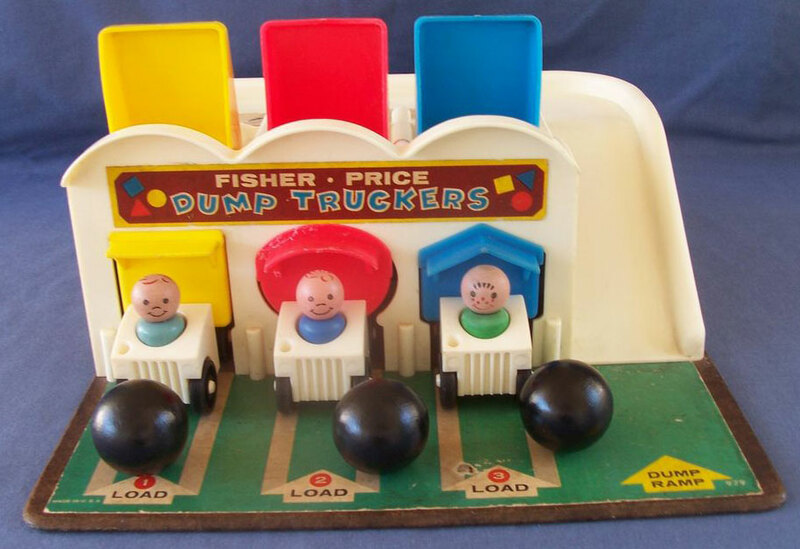 FPT428 - Dump truck with a yellow rounded tilting bed. FPT426 - Dump truck with a red triangular tilting bed. BAWW - Dark blue boy with a frowning face and freckles. BCWW - Dark blue boy with a smiling face, freckles, and "" eyebrows. BBWW - Dark blue boy with a smiling face and red heat-stamped hair. 1965-1967 - FPT259 - The black balls were made of solid wood. See our Replacement Reproduction Wooden ball: TOT100. 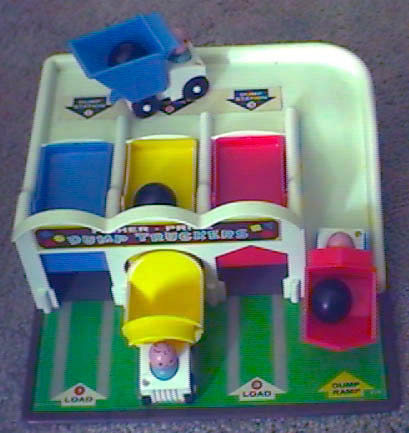 1968-1970 - FPT258 - The black balls were make hollow plastic. See our Replacement Reproduction PLASTIC ball: TOT105. B979A - Square stall #1 yellow, circle stall #2 blue, triangle stall #3 red. B979B - Square stall #1 yellow, circle stall #2 red, triangle stall #3 blue. B979C - Square stall #1 red, circle stall #2 blue, triangle stall #3 yellow. B979D - Square stall #1 red, circle stall #2 yellow, triangle stall #3 blue. B979E - Square stall #1 blue, circle stall #2 red, triangle stall #3 yellow. B979F - Square stall #1 blue, circle stall #2 yellow, triangle stall #3 red. FPT430 - Circular blue truck bed. FPT427 - Square blue truck bed. FPT418 - Triangle blue truck bed. FPT417 - Circular red truck bed. FPT429 - Square red truck bed. FPT426 - Triangle red truck bed. FPT428 - Circular yellow truck bed. FPT419 - Square yellow truck bed. FPT431 - Triangle yellow truck bed. Whew, that's alot of variations for a set that was made for only 5 years! Retail price in the 1971 J.C. Penneys Spring and Summer Catalogue was $4.99.